Death hasn't visited Rowan Rose since it took her mother when Rowan was only a little girl. But that changes one bleak morning, when five horses and their riders thunder into her village and through the forest, disappearing into the hills. Days later, the riders' bodies are found, and though no one can say for certain what happened in their final hours, their remains prove that whatever it was must have been brutal. Rowan's village was once a tranquil place, but now things have changed. Something has followed the path those riders made and has come down from the hills, through the forest, and into the village. Beast or man, it has brought death to Rowan's door once again. The Glass Casket was a surprise for me! I love dark, creepy stories, but a lot of the time when I pick up a story expecting it, I do not get it and it is disappointing. I was most definitely not disappointed by Ms. Templeman! The story was dark from beginning to end, and other than a few bright spots, this wasn't a happy story with a perfect ending. This ending was real, and felt true to the story. I think, if it had had a happy ending, it would have taken away from the story that the author was trying to create. 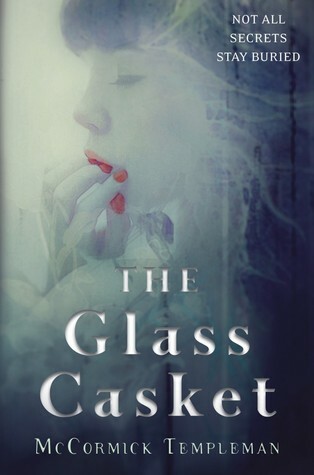 The Glass Casket is a slower paced story, but the depth of the story more than makes up for it. And when the pace does pick up at the end, it keeps you on the edge of your seat. I loved the characters. Even the ones that I did not like, I had to love because they were so exceptionally well written. From the main character Rowan Rose, and her best friend Tom, to Tom's brother Jude and the mysterious new girl Fiona Eira, each character was unique, interesting and had a story to tell in their own right. I loved that the POV switched off between a few of out main characters, and then some new characters that aren't previously mentioned. I feel like this added another dimension to the story, added to the fear and desperation and sense of wrongness! The setting of the story was also perfectly imaginable. I can close my eyes even now, a week later, and imagine myself walking through Nags End on Market Day. A seeming cross between Snow White and Red Riding Hood, with elements of both thrown in but made wholly original, I thoroughly enjoyed The Glass Casket. I highly recommend it to anyone who loves a tension-filled, terror-filled, good old creepy story! Last but not least, I have to mention the cover. It is stunning, and the brains behind it deserve serious kudos! This book sounds really good!!! I really love re-tellings of all kinds, so a mix of two is really up my ally! It was really interesting, finding the different parts of the different re-telling's. This is a good story. It is a dark one, but I thoroughly enjoyed it. I hope you get the chance to check it out soon!